In the year of 2010 I finished collecting the paved ascents going above 2000 m in the PyrenĂ©es by my bicycle, because I cycled all of them. After it, I checked how many similar climbs I missed in the Alps. The missing ascents seemed to be too many for a season, but then I decided trying to cycle all of them. 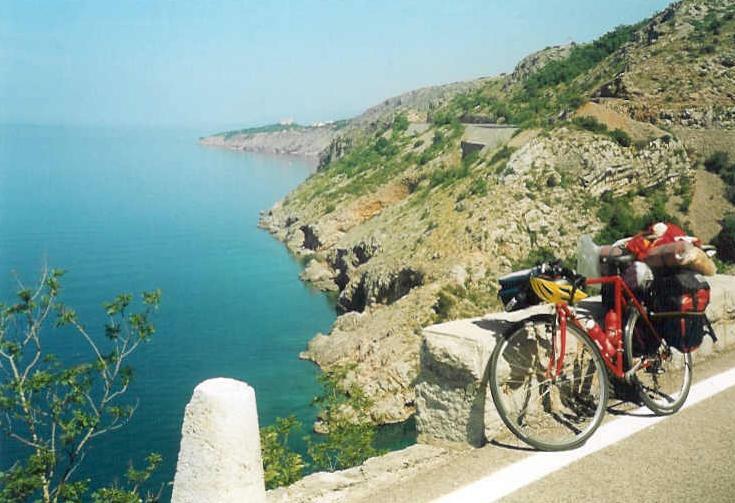 I had 3 bicycle tours in 2011 in the Alps: few days in May, less than 2 weeks in the French Alps in June and 3 weeks in the swiss and italian Alps in July. After the middle of May as I checked the weather forecast, good weather arrived to Tirol and South Tirol, the temperatures were above the average, so I decided to travel there for cycling few days and visit 6 such ascents going above 2000 m, where I had never been cycled. On the 19th of May after travelling a lot by train I arrived at a small village, not far from the italian town, Bressanone (Brixen), where I set up my tent. Immediately I prepared a small pack for the tour and then left the camp for cycling up towards Plose, to Kreuztal / Val Croce (2029 m), a ski lift station, which can be reached on paved road. It meant not much less then 1500m heightdifference with an average 6-8% steepness. To the height of 1200 m the road climbed in a forest, then sometimes I got views to the Geisler mountain peaks with snowmeadows on it. Few times ĂŤ went trought small villages, between few houses, but the road didnâ€™t remain too memorabe for me. After the junction at 1697 m, the road ascended in forest that didnâ€™t let me enjoy the view. After reaching the panoramic top (8 degrees Celsius), I quickly put on enough clothes and a cap and descended to the camp by twilight. 20th May, 2011: Vahrn â€“ Ortisei â€“ Passo Gardena (2121 m) â€“ Passo Sella (2240 m) â€“ Canazei â€“ Pozza di Fassa â€“ Rif. Gardeccia (1950 m) â€“ Predazzo Tesero â€“ Alpe di Pampeago â€“ Zischgalm (2000 m) â€“ Bolzano + cycling to the camp, from Fortezza = 175,68 km + 3848 m heightdiff. I had serious plans for this day and I was supported by bright sunshine in the morning. I warmed up my legs in the lightly descending valley to Ponte Gardena, where I turned towards Val Gardena, where I had to face with more than 1600 m heightdifference to the Passo Gardena / GrĂ¶dnerpass (2121 m), where I last cycled 15 years before, in the year 1996. That was my first pass above 2000 m that I cycled. I was 20 years old then. It was good to return in the year, when I planned to finish collecting all of the paved ascents of the Alps above 2000 m. Just like a frame: Passo Gardena by the start and almost by the end. The ascent was very light and only averagly scenic to Ortisei (St. Ulrich). In this town and in the next one in Wolkenstein there are a lot of wood-carver and carvings are sold. The real ascent started at the end of Wolkenstein, from where I could enjoy the view to the snowy, rocky Sella mountains and the Sassolungo also showed itself. Pushing the pedals towards Passo Gardena I was surprised by the snowmeadows and sometimes little bit snow along the road or the snowwall along those sections of the road that was rarely shined by the Sun. I often stopped for taking photos or making movie with my videocamera. Backwards clouds started to darken around Sassolungo and at the time when I reached the level of 1900m, it started raining there. After the pleasurable ascent I looked down to the other side of the pass, 15 years after when I I had cycled there last time. 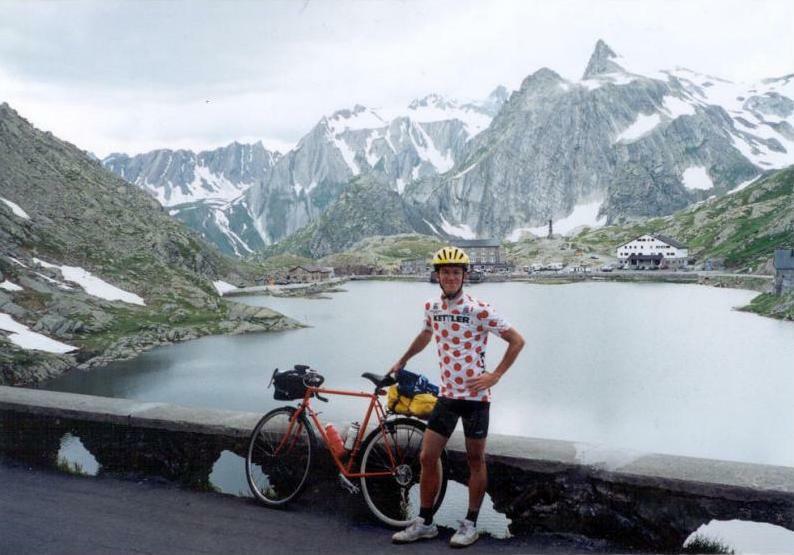 In the year 1996 that was the first time of cycling onto high passes, next to high mountains. After turning back I rolled down to the junction, from where I had to climb half an hour to Passo Sella (2240 m). However somewhere snow-meadows could be seen I didnâ€™t feel cold when I was cycling in short cycling short. I reached the Passo Sella (2240 m) together with few italian cycling guys. I was amazed by the southern panorama: southwards the mountains were covered by serious snow: the mountains were mainly white. It was like in February in Hungary. After putting on enough clothes I started descending, but the suberb views made me stop and take photos sometimes. It was beautiful. I have never cycled so early in the year in the High Alps, between so high mountains. My feet felt cold, so at the half of the descent I stopped to put on another pair of socks. Arriving at Canazei, it was 14 degrees Celsius there. I stopped for eating ca. 5-7 kms further, but there I wasnâ€™t felt warm enough. I enjoyed wearing a cap. The next ascent was the 6 km long, often 13-15% steep road to Rifugio Gardeccia (1950 m), which was visited by the Giro dâ€™Italia 2 days later. Just as I turned right, the steepness became 13-16%. After the 1st steep km, it was light for another 1 km, then the last kilometers were steep again. Although I had only ca. 4 kg weighted pack on my bicycle, because of the thing, that I didnâ€™t feel strong enough, I searched a proper place to hide them, and I could keep on cycling without that 4 kgs. The road went upwards mainly in the forest, the trees rarely let me see the mountains. I spend not too much time by the Rifugio, because one of the the hardest climb of the day waited for me. It was Alpe di Pampeago, and 3 kms further, the just 2000m high situated Zischgalm. Alpe di Pampeago was visited by the Giro dâ€™Italia few times, and is said to be a hard ascent. I had its steepness-diagram, so I knew, it had a 4 km long section with 11-15% steepness. My legs had already felt the effect of the previous 125 kms + 2800 m heightdifference. I canâ€™t remember how much time ago I had to struggle so much. Sometimes when I was pushing the pedals I told to myself â€žIt doesnâ€™t hurt! It doesnâ€™t hurt!" It was hard, because I had not too much time, I couldnâ€™t let me stop too often, because I had to catch the last train in Bolzano. On the fastest descent of my life (50-60 km/h for several minutes long) I reached Bolzano in time and caught the train without any problem. It was a wonderful and memorable day! 21th May, 2011: Travelling to Austria and then by bicycle: Haiming â€“ KĂĽhtai â€“ road to Diga Finstertal / Speicher Finstertal to 2190 m high â€“ KĂĽhtai (2020 m) â€“ 1 km descent - KĂĽhtai â€“ Oetz â€“ SĂ¶lden â€“HochsĂ¶lden (2080 m) â€“ Haiming = 150 km + 3041 m heightdiff. After travelling to Austria I set up my tent in a camp of Haiming, where I had spent a night a year before. Quickly I left for climbing up to KĂĽhtai (2020 m) and the 3 km long steep ascent from there, a 2350 m high situated mountain lake: Speicher Finstertal. That was the 3rd occasion that I cycled KĂĽhtai from this direction. Down in the valley it was warm, but above 1600 m I needed my long arm jersey. Just when I turned right to the steep ascent by the first houses of KĂĽhtai, it started raining. I stopped for a time, I ate something, but then I kept on cycling in rain. The climb is a panoramic ascent with beautiful landscape. From the start I saw snow-meadows and unfortunately at ca. 2190 m the road was covered serious snow, that made me turn back. There was no other choice. I was sad, but then I thought it, as I could reach the top, because I tried it and needed only 1 km. (Note: because of my aim for clear comparison result and my conscience, at the end of my tour in July, after Switzerland and Italy I returned for that missing 1,5 km. And it was worth visiting !) To lessen my remorse, I descended and ascended the same heightdifference from KĂĽthai that I missed above. I descended to Oetz, where I ate again and saw not too hopeful weather towards SĂ¶lden and HochsĂ¶lden. I had serious aims for this season, so I kept on cycling and didnâ€™t mind the weather. I cycled the second half of the valley in rain and started the 7 km long, 10% steep ascent in rain too, at the time of the sunset. It wasnâ€™t fun, but I had to do it for my aim: to the end of te year 2011 to have the longest list on the internet, consisting of paved ascents in the Alps going above 2000 m that I cycled. That climb was a task and I could do it by 6,8 km/h. I reached HochsĂ¶lden (2080 m) at quarter before 10 pm and measured 7 degrees Celsius there. Thanks for my warm clothes and cap I didnâ€™t feel cold and could cycle back to the camp without any problem. I went to sleep at 1 am, but the following day wasnâ€™t planned easier, but even harder. I slept only 6 hours, but I was motivated. I knew that my 1st climb is one of the hardest in Austria. Itâ€™s Idalpe (2320 m), which is 7 km long with 950m heightdifference, but 3kms of the 7 kms is 15-17% steep. Brutal! Or with other words: Itâ€™s a killer one. For the afternoon I planned to visit / had to visit Belpiano (2105 m), above the Passo Resia (1504 m). I travelled a little bit to Landeck, I had my breakfast on the train. After leaving Landeck I was surprised by the sign, that Silvretta road, BielerhĂ¶he pass (2038m) was closed because the winter hadnâ€™t finished yet. I cycled in the known and not too steep valley to Ischgl. I just ordered my pack for the ascent, when a quick shower arrived and made me find a roof to hide. The rain made me think not to carry all of the 4 kg weighted pack up to Idalpe, so after eating something I left the half of my packs down; I hided them. The ascent started with 10-13% steepness, there wasnâ€™ any warm-up. My POLAR measured 12,5% with 14-16% maximum grade instead of the diagramâ€™s 10-11%. Fortunately there was a very short lighter section, where my puls could decrease. At ca. 1670 m there was a sharp corner by a cable-car lift station and view to the mountain and there was the last light section. There began the 3 hardest kilometers with 15-17% steepness. It was hard, but the wonderful landscape often made me stop: taking photos or take down my camera and after a short descent cycle back to be recorded by the camera ď�Š On that section my POLAR sometimes measured 17-19% steepness. During cycling I detailled the main target to smaller aims: for example not to stop during the following steep 200 m section or until reaching the height of 1900m, etc. It was hard, I was struggling. From above I could see more and more about the Fimba valley and besides the snowy mountains I realised the little bit darker clouds. Above 2180 m the steepness decreased under 13%, it was lighter ď�Š At last I reached the top at 2 pm. I made enough movie, put on some clothes and when I carefuly started the descent, I felt drizzling rain on my face, palms. My brakes lessened seriously last night, down from HochsĂ¶lden, so I had to be very careful, because I realised that I didnâ€™t have to let the bike fasten above 30 km/h, because on such a steep road with not the best brake I wouldnâ€™t be able to decrease the speed and turn the bend in time. Sometimes I was afraid of the not proper brakes. With very low speed I reached Ischgl safe and sound and could felt reassured. Descending in the valley to Landeck I had to stop for a short time because of another short shower, but then strong wind supported me. By Landeck I turned South, into another known, but unliked, too long and lightly ascending valley. I had not too much time, so I thought I only waste time there, but I had no other choice. After halfway to Passo Resia (1504 m) another rainzone appeared behind me and in front of me, by the direction of the Belpiano. Fortunately the rains didnâ€™t fly above the place, where I was cycling. After eating my sandwiches, it was quarter past 8, when I started the climb to Belpiano, from the shore of the Lago di Resia (lake). I knew that I would reach the climb after sunset and I had to cycle ca. 100 kms to the camp, because it was imposible to catch the last train in Landeck, but I was highly motivated to cycle the last ascent above 2000 m of the tour. The road rarely offered views, so it didnâ€™t remain a memorable climb, but I climbed it. I reached Belpiano at half past 9. Backwards I didnâ€™t have too much food, so I entered a fast food restaurant or buffet, where fortunately I could buy a very good sandwich. It helped me a lot. I left Pfunds around 11 pm and after cycling downwards in that slow valley I arrived at Landeck before 1 am, where I ate someting before the last 30 kms. And it started raining againâ€¦.., but with my spirit and after the succesful day I couldnâ€™t be angry. I listened music with the mp3 player and was pushing the pedals steadily. I didnâ€™t know how, but after a while the road started ascending and I felt me warmer and warmer in the jacket. I didnâ€™t think the climb would be long, so I kept on cycling, but I was more and more angry: â€ž-How long will it last? Will it go to the Everest ? "- I thought. Because I planned the day shorter, I didnâ€™t have a map about that valley, so I had no information where the road goes. After a while I was afraid of the thing that I didnâ€™t cycle on the right road. At last I arrived at Imst and then at 3. am. at the camp in rain. Instead of feeling bad or angry, I was happy, because I did all of the climbs that I had planned. Although during that 3,5 days I was bicycling hours in rain, I thought I had succesful and great tours. Looking back for the last 2 days (but the other â€“ the 2nd day - in Italy was hard too) I was amazed how my body could get the energy for this day, after the previous day and only 6 hours sleeping. During my last day I was cycling 232 kms + 3706 m heightdifference and I used 5640 kcal energy, which is a rare value for me. I think motivation and my great aim could be the answer, how my body was able to do this last day. The weather that I experienced during this 3-4 day long holiday and my reaction and how I answered for this, was only a short preview of my longer tours: in June in the French Alps and in July in the swiss and italian Alps. During my other two tours (French Alps: 1530 km + 28989m and the swiss & italian Alps: 2358 km + 49663 m); together I cycled 3888 km + 78652 m heightdifference. With these few days in Tirol and South-Tirol in the year 2011 I cycled more than 90.000 m heightdifference in the Alps. Based on my experienced during these days in May I could face with rainy hours cycling on Col de la Lombarde (2350 m) or Santuario St Anna, or 2 hours in rain on the road of Col dâ€™Izoard (2361 m) or on the ascent of Col du Lautaret (2058 m), or ca. 2 hours in rain on Col du Petit St Bernard (2188 m) without feeling down. And that happened only in Franceâ€¦. In July, in France the temperatures were mild, warm, so I think these things and my previous experiences and my motivation helped me get over the difficulties. Later, in July in Italy and Switzerland my french alpine rainy experiences gave me enough strength, spirit to get over the rainy ascents, hours, days. 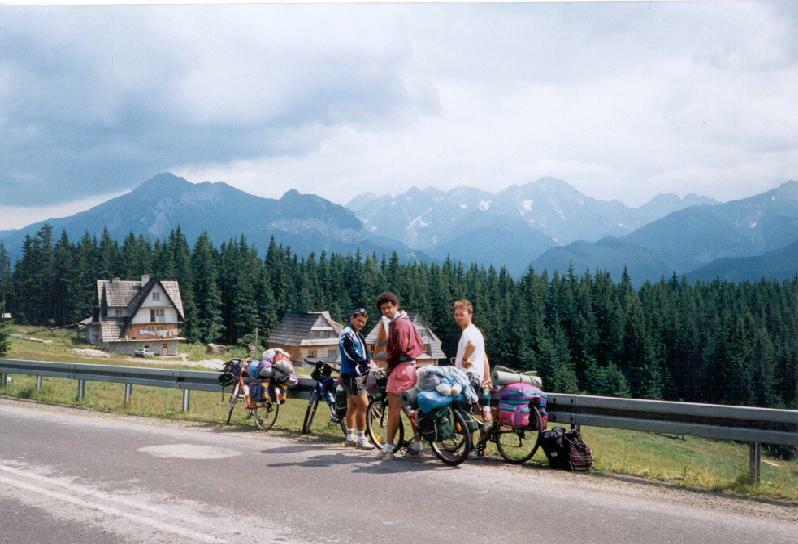 I had the worse weather of the years since I had started bicycle touring abroad in the year 1993. I had ascended 4 high ascents in rain: Champillon (2078m), Alpage Mandelon (2066 m) and Crans Montana, OberlĂ¤ger (2025 m), partly Passo San Gottardo and Lago di Naret (2310 m), then Diga Campomoro and Passo Gavia (2621 m). But that was another storyâ€¦., about which I would like to uĂ¶ploead my trevalogue to the end of February, 2011.